The aim of this study was to investigate the morphological development of fungiform papillae in native Korean goats by scanning electron microscopy (SEM). Tongues were removed from fetuses on days 120 and 150 of gestation and from juveniles on days 30, 60, 90, 120, 150, and 180 after birth. The sizes of fungiform papillae in the newborn were 225.0-250.0 μm, the weaning period of 60-day-old goats was 271-294 μm and the maturing period of 180-day-old goats was 385-398 μm, respectively. The primordia of fungiform papillae had the typical feature of a mushroom shape in a 120-day-old fetus. In a 150-day-old fetus (neonate), fungiform papillae had features similar to those of the adult form and showed a gradual increase in size with slight morphological changes until 150-day-old goats. Microridges, microplicae, and micropits were well developed on the epithelial surface of lingual papillae from 60 to 150-day-old goats. The results obtained in this study might provide some basic data on the mechanisms that control the morphogenesis and development of the lingual papillae in ruminants. The dorsal surface of tongue contains numerous macroscopic papillae. These papillae differ somewhat in shape, are named according to their morphologic characteristics, and serve either a mechanical or a gustatory function. Mechanical papillae are involved in mastication and food movement, and gustatory papillae are involved in gustatory sense with taste bud [1, 2]. Mechanical papillae were able to divide it into filiform, conical and lentiform papillae according to their shape, moreover, the distribution and disposition of these papillae have many differences depending on mastication and prehension habits of animals [1, 2]. On the other hand, gustatory papillae were divided into fungiform, vallate, and foliate papillae depending on their morphological characteristics but foliate papilla was not found in ruminants. These gustatory papillae were also known to have large differences in its number and shape according to habits for main feeds of respective animals [2, 3, 4]. Using SEM, they studied papillae from a variety of animal, such as goat , sheep  horse , cow , Japanese weasels , opossum , rat , mouse . Among them, a few numbers of studies were performed with ruminants. Concerning lingual papillae of goats, Kumar et al  and Cho  have been studied filiform, fungiform, conical, vallate, and lentiform papillae. Even though Korean native goats have been the objective of study on behalf of Holstein, Korean native cattle or sheep as ruminants, there have been no morphological changes on Korean native goats tongue focused on their development. Therefore, to understand the progress of development of fungiform papillae, we have investigated the changes of its size and shape during the development in goats. The tongues examined in this study were removed from 120, 150-day-old fetuses (newborn) originated from 2 to 4 years old Korean native goats (body weight 23 to 33 kg) by caesarean section. We also examined the tongue of 30, 60, 90, 120, 150, and 180-day-old Korean native goats to know about the development of tongue. The measurement of fungiform papillae was performed by measuring the minimum and maximum diameter of its papillae using SEM from neonates to 180-day-old goats. Tissues for scanning electron microscopy observations were fixed using 2.5% glutaraldehyde 4 hr at room temperature and areas appropriate for inspection were dissected and osmicated in 1.0% osmium tetroxide at 4°C for 2 hr. After washing with PBS three times, the tissues were dehydrated using a graded series of ethanol solutions. The specimens were dried critical to point, and then placed on spinner stubs, and coated with gold to a depth of 100 μm as SEM coating unit. The specimens were observed under scanning electron microscope (SEM-AL 300, Philips) operated at 15 KV. The minimum and maximum diameters of fungiform papillae from neonate to 180-day-old goat were revealed respectively. The minimum and maximum diameter of newborn papillae were 225.0 ± 9.0 and 250.0 ± 26.5, The weaning period of 60-day-old goats were 271 ± 19.5 and 294 ± 18.5 μm, and the maturing period of 180-day-old goats were 385 ± 42.7 and 398 ± 17.0 μm, respectively (Fig. 1). Figure 1. SEM measurements of length of fungiform papillae. Each of minimum and maximum diameters was measured from neonates (P0) to 180-day-old Korean native goats (P180). In prenatal developing goats, the primordia of fungiform papillae of 120-day-old fetuses had the typical feature of mushroom shape (Fig. 2a). The fungiform papilla of 150-day-old fetus had similar feature as adult’ form (Fig. 2b). Figure 2. Scanning electron micrographs of the prenatal fungiform papillae of Korean native goats. (A) Embryonic day 120 (E120), (B) E150, FIP: filiform papillae, FUP: fungiform papillae. Scale bar: 100 μm. In 30-day-old goats, the fungiform papillae were increased in size with slight morphological changes (Fig. 3a). 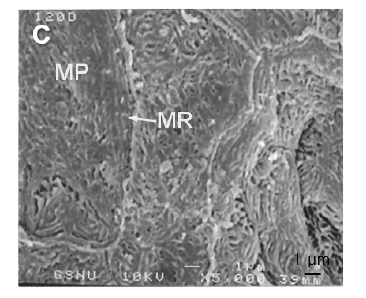 The wall of taste pore in fungiform papillae of 30-day-old goats had microplicae, microridges and micropits which were poorly developed on the epithelial surface of its papillae (Fig. 4a). Figure 3. Scanning electron micrographs of the postnatal fungiform papillae of Korean native goats. 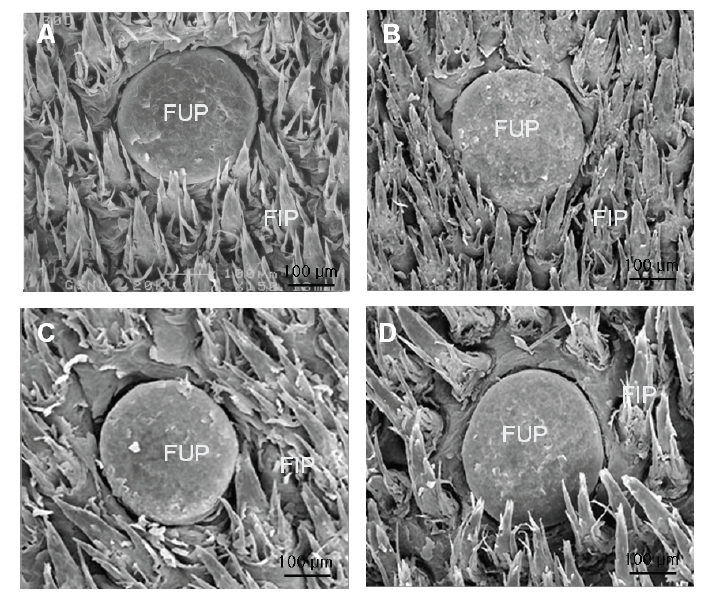 (A) P30, (B) P60, (C) P90, (D) P150, FIP: filiform papillae, FUP: fungiform papillae. Scale bar: 100 μm. Figure 4. High magnification of the epithelial surface in fungiform papillae of Korean native goats. (A) P30, (B) P60, (C) P150, MR: microridge, MP: microplica, TP: taste pore. Scale bar: 1 μm. 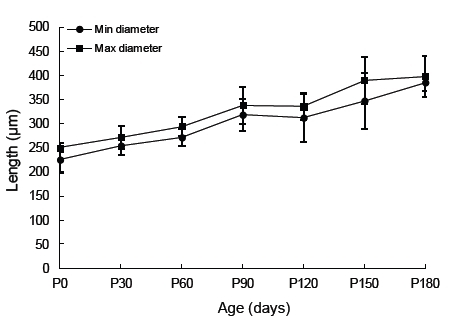 In 60-day-old goats, the size of fungiform papillae gradually increased, but did not show significant differences in shape compared to those of 30-day-old goats (Fig. 1, 3b). The microplicae were showed beehive-like shape (Fig. 4b). In 90-day-old goats, the surface of fungiform papilla was smooth and its shape was developed as complete as those of adult one (Fig. 3c). Keratinizations were much preceded and it had some unevenness on the surface of the papillae (Fig. 3c). In 150-day-old goats, fungiform papillae were well developed without much difference in shape (Fig. 3d). The microridges and microplicae were very well developed on the surface of fungiform papillae (Fig. 4c). Ruminants have five different types of lingual papilla namely filiform, conical, fungiform, circumvallate, and lentiform papillae on the dorsal surface of the tongue . A few numbers of studies were performed using adult goats weighing around 15 kg by measuring the length, immunohistochemical studies on neurotransmitter, and scanning electron microscopical studies on lingual papillae of the tongue [4, 12]. However, no comparative studies of changes in three-demensional structure during development of fungiform papillae in goats have been reported. Concerning the tongue of Korean native goats, Lee et al  reported that the size of fungiform papillae were 350~550 μm in diameter using male Korean native goats with body weight of 15 kg. Kumar et al  reported that the size of fungiform papillae, Pamurna pairi goats of 6 to 8-month-old, were 278~350 μm on ventral surface and 304~398 μm on dorsal surface. In this study, the minimum and maximum diameter of newborn papillae were 225.0~250.0 μm, the weaning period of 60-day-old goats were 271~294 μm, and the maturing period of 180-day-old goats were 385~398 μm, respectively. Therefore, the sizes of fungiform papillae of goats were similar to other studies, but the size of fungiform papillae was gradually increased during development of goats in this study. On the lingual papillae of fetuses, Iwasaki et al  reported that the rudiments of filiform papillae formed between E12 and E16 after the appearance of the rudiments of fungiform and cicumvallate papillae. Iwasaki et al  also reported that primordia of fungiform papillae arranged in the form of lattice were observed on 15-day-old mouse fetuses while primordia of filiform papillae were not sprouted up. Boshell et al  reported that fungiform and vallate papillae grew faster than filiform papillae in human. In this study, the features of fungiform papillae were shaped like a mushroom, however primordia of filiform papillae were a little bit developed compared with fungiform papillae in 120-day-old fetuses. Fungiform papillae of neonates appeared to be shaped similar to those of adult, but filiform papillae had a shape of an obliquely sectioned cylinder with empty inside, and its outlines looked like rough sow blade with irregular height. In 150-day-old goats, filiform papillae were observed to be completely compacted at inner surface and had completed the morphogenesis as in adult. This result suggests that the mechanism of morphogenesis and development of fungiform papillae might be different from those of nongustatory filiform papillae. Concerning fine structure on the epithelia surface of lingual papillae, Iwasaki et al  reported that no microvilli was found on the surface of epithelia of fungiform papillae, but the thickened borderline at the margin of neighboring cells made it possible to distinguish the borderlines between cells in 15-day-old mouse fetuses, and microridge-like structures were observed on the epithelial cells at the base of filiform papillae in mouse newborns. The surface structure of lingual epithelia of 12-day-old rat fetuses and that of 15-day-old mouse fetuses were very similar . In this study, microplicae of fungiform papillae were arranged in the form of beehive in 60-day-old goats and well developed until 150-day-old goats. Therefore, the surface structures of lingual epithelia of Korean native goats were very similar to other species. In conclusion, the results obtained from the present study provide basic data for future studies of the morphogenesis of the lingual papillae in ruminants and of the differentiation of cells in the lingual mucosa in mammals by histological and immunohistochemical investigations. 1.Banks WJ. Applied veterinary histology, 2nd ed. Williams & Wilkins: Baltimore; 1986. p. 380-383. 2.Dye KM, Sack WO, Wensing CJG. Veterinary anatomy, 2nd ed. Saunders: Philadelphia; 1996. p. 99-150. 3.Furubayashi R, Sato E, Ishibashi T. Histological pattern of the tongue in the Japanese weasels. Mastela itatsi, with special reference to the morphology and distribution of papillae, taste buds and lingual gland. Acta Anat 1989;64:210-214. 4.Lee HS, Lee IS, Kang TC. Immunohistochemical study on the distribution of neuropeptides in the tongues of Korean native goats. Korean J Vet Res 1996;36:265-276. 5.Kumar P, Kumar S, Singh Y. Tongue papillae in goat: a scanning electron-microscopic study. Anat Histol Embryol 1998;27:355-357. 6.Bradley RM, Mistretta CM. Chorda tympani responses to lingual application of taste stimuli in foetal sheep. J Physiol 1971;218:104-109. 7.Chamorro CA, de-Paz P, Sandoval J, Fernandez JG. Comparative scanning electron-microscopic study of the lingual papillae in two species of domestic mammals (Equus caballus and Bos taurus). 1. Gustatory Papillae. Acta Anat (Basel) 1986;125:83-87. 8.Davies RO, Kare MR, Cagan RH. Distribution of taste buds on fungiform and circumvallate papillae of bovine tongue. Anat Rec 1979;195:443-446. 9.Krause WJ, Cutts JH. Morphological observations on papillae of the opossum tongue. Acta Anat 1982;113:159-168. 10.Iwasaki S, Yoshizawa H, Kawahara I. Study by scanning electron microscopy of the morphogenesis of three types of lingual papillae in the Rat. Anat Rec 1997;247:528-541. 11.Iwasaki S, Yoshizawa H, Kawahara I. Study by scanning electron microscopy of the morphogenesis of three types of lingual papilla in the mouse. Acta Anat 1996;157:41-52. 12.Cho GH. Morphological studies on the development of the tongues in Korean native goats, doctoral dissertation, Gyeongsang National University: Jinju; 2002. p. 1-106. 13.Boshell JL, Wilborn WH, Singh BB. A correlative light microscopic, transmission and scanning electron microscopic study of the dorsum of human tongue. Scan Electron Microsc 1980;3:505-510.